This article is about the county. For the city with the same name, see Fairfax, Virginia. For other uses, see Fairfax (disambiguation). Fairfax County, officially the County of Fairfax is a county of the Commonwealth of Virginia in the United States. Part of Northern Virginia, Fairfax County borders both the City of Alexandria and Arlington County and forms part of the inner suburban ring of Washington, DC. The county is thus predominantly suburban in character, with some urban and rural pockets. The Fairfax County Courthouse at Fairfax in 2010. As of the 2010 census, the population was 1,081,726, in 2015, it was estimated at 1,142,234, making it the Commonwealth's most populous jurisdiction, with 13.6% of Virginia's population. 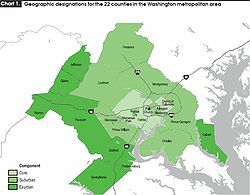 The county is also the most populous jurisdiction in the Washington-Arlington-Alexandria, DC-VA-MD-WV Metropolitan Statistical Area, with 19.8% of the MSA population, as well as the larger Washington-Baltimore-Arlington, DC-MD-VA-WV-PA Combined Statistical Area, with 13.1% of the CSA population. The county seat is the City of Fairfax, though because it is an independent city under Virginia law, the city of Fairfax is not part of Fairfax County. Fairfax was the first U.S. county to reach a six-figure median household income and has the second-highest median household income of any county-level local jurisdiction in the United States after neighbor Loudoun County. 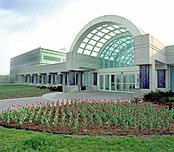 The county is home to the headquarters of intelligence agencies such as the Central Intelligence Agency, National Geospatial-Intelligence Agency, and National Reconnaissance Office, as well as the National Counterterrorism Center and Office of the Director of National Intelligence. The county is also home to seven Fortune 500 companies, including three with Falls Church addresses; although Falls Church is its own independent municipality. At the time of European encounter, the inhabitants of what would become Fairfax County were an Algonquian-speaking sub-group called the Taux, also known as the Doeg or Dogue. Their villages, as recorded by Captain John Smith in 1608, included Namassingakent and Nemaroughquand on the south bank of the Potomac River in what is now Fairfax County. Virginian colonists from the Northern Neck region drove the Doeg out of this area and into Maryland by 1670. Fairfax County was formed in 1742 from the northern part of Prince William County. It was named for Thomas Fairfax, 6th Lord Fairfax of Cameron (1693–1781), proprietor of the Northern Neck. The Fairfax family name is derived from the Old English phrase for "blond hair" – Fæger-feax. The oldest settlements in Fairfax County were along the Potomac River. George Washington settled in Fairfax County and built his home, Mount Vernon, facing the river. Gunston Hall, the home of George Mason is nearby. Modern Fort Belvoir is partly on the estate of Belvoir Manor, built along the Potomac by William Fairfax in 1741. Thomas Fairfax, 6th Lord Fairfax of Cameron, the only member of the British nobility ever to reside in the colonies, lived at Belvoir before he moved to the Shenandoah Valley. The Belvoir mansion and several of its outbuildings were destroyed by fire immediately after the Revolutionary War in 1783, and George Washington noted the plantation complex deteriorated into ruins. In 1757, the northwestern two-thirds of Fairfax County became Loudoun County. In 1789, part of Fairfax County was ceded to the federal government to form Alexandria County of the District of Columbia. Alexandria County was returned to Virginia in 1846, reduced in size by the secession of the independent city of Alexandria in 1870, and renamed Arlington County in 1920. The Fairfax County town of Falls Church became an independent city in 1948. The Fairfax County town of Fairfax became an independent city in 1961. Located near Washington, D.C., Fairfax County was an important region in the Civil War. The Battle of Chantilly or Ox Hill, during the same campaign as the second Battle of Bull Run, was fought within the county; Bull Run is the border between Fairfax and Prince William Counties. Other areas of activity included Minor's Hill, Munson's Hill, and Upton's Hill, on the county's eastern border, overlooking Washington, D.C. The federal government's growth during and after World War II spurred rapid growth in the county and made the county increasingly suburban. Other large businesses continued to settle in Fairfax County and the opening of Tysons Corner Center spurred the rise of Tysons Corner. The technology boom and a steady government-driven economy also created rapid growth and an increasingly growing and diverse population. The economy has also made Fairfax County one of the nation's wealthiest counties. A general aviation airport located along U.S. Route 50, west of Seven Corners called the Falls Church Airpark operated in the county from 1948 to 1960. The facility's 2,650 foot unpaved runway was used extensively by private pilots and civil defense officials. Residential development, multiple accidents, and the demand for retail space led to its closure in 1960. According to the U.S. Census Bureau, the county has a total area of 406 square miles (1,050 km2), of which 391 square miles (1,010 km2) is land and 15 square miles (39 km2) (3.8%) is water. Fairfax County is bounded on the north and southeast by the Potomac River. Across the river to the northeast is Washington, D.C., across the river to the north is Montgomery County, Maryland, and across the river to the southeast are Prince George's County, Maryland and Charles County, Maryland. The county is partially bounded on the north and east by Arlington County and the independent cities of Alexandria and Falls Church. It is bounded on the west by Loudoun County, and on the south by Prince William County. Most of the county lies in the Piedmont region, with rolling hills and deep stream valleys such as Difficult Run and its tributaries. West of Route 28, the hills give way to a flat, gentle valley which stretches west to the Bull Run Mountains in Loudoun County. Elevations in the county range from near sea level along the tidal sections of the Potomac River in the southeast portion of the county to more than 500 feet (150 m) in the Tysons Corner area. The Piedmont hills in the central county are made up of ancient metamorphic rocks such as schist, the roots of several ancestral ranges of the Appalachians. The western valley is floored with more recent shale and sandstone. This geology is similar to adjacent bands of rocks in Maryland and further south in Virginia along the eastern front of the Appalachians. An area of 11 square miles (30 km2) of the county is known to be underlain with natural asbestos. Much of the asbestos is known to emanate from fibrous tremolite or actinolite. The threat was discovered in 1987, prompting the county to establish laws to monitor air quality at construction sites, control soil taken from affected areas, and require freshly developed sites to lay 6 inches (150 mm) of clean, stable material over the ground. For instance, during the construction of Centreville High School a large amount of asbestos-laden soil was removed and then trucked to Vienna for the construction of the I-66/Nutley Street interchange. Fill dirt then had to be trucked in to make the site level. Marine clays can be found in widespread areas of the county east of Interstate 95, mostly in the Lee and Mount Vernon districts. These clays contribute to soil instability, leading to significant construction challenges for builders. Fairfax County uses the urban county executive form of government, which county voters approved in a 1966 referendum. Under the urban county executive plan, the county is governed by the 10-member Fairfax County Board of Supervisors with the day-to-day running of the county tasked to the appointed Fairfax County Executive. Nine of the board members are elected from the single-member districts of Braddock, Dranesville, Hunter Mill, Lee, Mason, Mount Vernon, Providence, Springfield, and Sully, while the chairman is elected at-large. In addition to the Board of Supervisors, three constitutional officers; the Commonwealth's Attorney, Clerk of the Circuit Court and Sheriff, as well as the 12 members of the Fairfax County School Board, are directly elected by the voters of Fairfax County. The Fairfax County Government Center is west of the City of Fairfax in an unincorporated area. Fairfax County contains an exclave unincorporated area in the central business district of the City of Fairfax, in which many county facilities (including the courthouses and jail) are located. Fairfax County was once considered a Republican bastion. However, in recent years Democrats have made significant inroads, gaining control of the Board of Supervisors and the School Board (officially nonpartisan) as well as the offices of Sheriff and Commonwealth Attorney. Democrats also hold all but one of the Fairfax seats in the Virginia House of Delegates and every seat in Senate. Fairfax County encompasses portions of three congressional districts, the 8th District, the 10th District, and the 11th District. Democrats represent all three districts with Jennifer Wexton representing the 10th District, Don Beyer representing the 8th District, and Gerry Connolly representing the 11th District. Communities closer to Washington, D.C. generally favor Democrats by a larger margin than outlying communities. In elections in 2000, 2001, and 2005, Fairfax County supported Democrats for U.S. Senate and governor. In 2004, Democratic presidential nominee John Kerry won the county, becoming the first Democrat to do so since Lyndon B. Johnson in his 1964 landslide (the last time Democrats carried the state until 2008). Kerry defeated George W. Bush in the county 53% to 46%. Democratic gubernatorial candidate Tim Kaine carried Fairfax County with over 60% of the vote in 2005, helping him to win 51.7% of votes statewide. In 2006, U.S. Senate candidate Jim Webb (D) carried the county with 58.9% of the votes, while winning the statewide election. In the state and local elections of November 2007, Fairfax Democrats picked up one seat in the House of Delegates, two seats in the Senate, and one seat on the Board of Supervisors, making their majority there 8–2. On November 4, 2008, Fairfax County continued its shift towards the Democrats, with Barack Obama and Mark Warner each garnering over 60% of the vote for president and U.S. Senate, respectively. Also, the Fairfax-anchored 11th District United States House of Representatives seat held by Thomas M. Davis for 14 years was won by Gerry Connolly, the Democratic Chairman of the Fairfax County Board of Supervisors. Braddock supervisor Sharon Bulova won a special election on February 3, 2009 to succeed Gerry Connolly as chairman of the Board of Supervisors, continuing a Democratic hold on the office that dates to 1995. Delegate David Marsden won a special election on January 12, 2010 to succeed Ken Cuccinelli in the 37th State Senate district. Following this election, Fairfax County is now represented in the Virginia State Senate by an all-Democratic delegation. In the 2010 congressional elections, Republican challenger Keith Fimian nearly defeated Democratic incumbent Gerry Connolly in the election for the 11th District seat, but Connolly won by 981 votes out of over 225,000 cast (a margin of 0.4%). Jim Moran and Frank Wolf were re-elected by margins of 61%–37% and 63%–35%, respectively. In 2012, Fairfax County solidly backed Barack Obama for re-election as president, with Obama nearly equaling his 2008 performance there by winning the county 59.6% to 39.1%. Former Governor Tim Kaine, running for the U.S. Senate in 2012, carried Fairfax County with 61% percent of the vote as part of his statewide victory. Representatives Connolly (D), Moran (D), and Wolf (R) were also reelected. Although Republican Governor Bob McDonnell won Fairfax County with 51% in November 2009, the Republican resurgence in Fairfax was short-lived. Four years later, in the November 2013 election, Democratic gubernatorial candidate Terry McAuliffe won Fairfax County with 58% of the vote, defeating incumbent state Attorney General and former Republican state senator from Fairfax, Ken Cuccinelli. McAuliffe's running mates, Ralph Northam and Mark Herring, also carried Fairfax County in their respective bids for Lieutenant Governor and Attorney General. These Democratic victories mirrored the Democratic ticket's sweep of the state's three executive offices for the first time since 1989. In the 2016 general election, Fairfax continued its trend towards Democratic candidates. Congressmen Beyer (D) and Connolly (D) were reelected, the latter of whom ran unopposed. Further, despite Donald Trump's victory in the Electoral College, Fairfax County supported Hillary Clinton with 64.4% of the vote to Trump's 28.6%, mirroring a heavy swing towards Democrats in Northern Virginia. 3.65% two or more races. 15.58% Hispanics or Latinos of any race. In 2000, there are 350,714 households, of which 36.30% have children under the age of 18 living with them, 59.40% were married couples living together, 8.60% had a female householder with no husband present, and 28.60% were non-families. 21.40% of all households were made up of individuals and 4.80% had someone living alone who was 65 years of age or older. The average household size was 2.74 and the average family size was 3.20. The age distribution was 25.40% under the age of 18, 7.50% from 18 to 24, 33.90% from 25 to 44, 25.30% from 45 to 64, and 7.90% who were 65 years of age or older. The median age was 36 years. For every 100 females, there were 98.60 males. For every 100 females age 18 and over, there were 96.20 males. The median income for a household in the county was $81,050, and the median income for a family was $92,146; in a 2007 estimate, these figures rose to $102,460 and $120,804, respectively. Males had a median income of $60,503 versus $41,802 for females. The per capita income for the county was $36,888. About 3.00% of families and 4.50% of the population were below the poverty line, including 5.20% of those under age 18 and 4.00% of those age 65 or over. A more recent report from the 2007 American Community Survey indicated that poverty in Fairfax County, Virginia had risen to 4.9%. Judged by household median income, Fairfax County is among the highest-income counties in the country, and was first on that list for many years[specify]. However, in the 2000 census it was overtaken by Douglas County, Colorado. According to U.S. Census Bureau estimates for 2005, it had the second-highest median household income behind neighboring Loudoun County, at $94,610. In 2007, Fairfax County reclaimed its position as the richest county in America, in addition to becoming the first county in American history to have a median household income in excess of $100,000, though not the first jurisdiction. In 2008, Loudoun County reclaimed the first position, with Fairfax County a statistically insignificant second. In 2012, the median household income in Fairfax County was $108,439. Fairfax County males have the highest life expectancy in the nation at 81.1 years, while females had the eighth-highest at 83.8 years. Children play frisbee baseball at one of Fairfax County's elementary schools. The county is served by the Fairfax County Public Schools system, to which the county government allocates 52.2% of its fiscal budget. Including state and federal government contributions, along with citizen and corporate contributions, this brings the 2008 fiscal budget for the school system to $2.2 billion. The school system has estimated that, based on the 2008 fiscal year budget, the county will be spending $13,407 on each student. The Fairfax County Public School system contains the Thomas Jefferson High School for Science and Technology, a Virginia Governor's School. TJHSST consistently ranks at or near the top of all United States high schools due to the extraordinary number of National Merit Semi-Finalists and Finalists, the high average SAT scores of its students, and the number of students who annually perform nationally recognized research in the sciences and engineering. However, as a Governor's School, TJHSST draws students not only from Fairfax County, but also Arlington, Loudoun, Fauquier, and Prince William counties, as well as the City of Falls Church. Fairfax County is also home to many Catholic elementary and middle schools. The schools fall under the Roman Catholic Diocese of Arlington. The Oakcrest School is a Catholic school in Fairfax County, which is not run by the Diocese. Paul VI Catholic High School is the Diocese run Catholic High School for Fairfax County. George Mason University is located just outside the city of Fairfax, near the geographic center of Fairfax County. Northern Virginia Community College (NVCC) serves Fairfax County with campuses in Annandale and Springfield a center in Reston which is a satellite branch of the Loudoun campus. The NVCC Alexandria campus borders Fairfax County. The University of Fairfax is also headquartered in Vienna, Virginia. Virginia Commonwealth University's School of Medicine recently constructed a medical campus wing at Inova Fairfax Hospital in order to allow third and fourth year medical students to study at other state-of-the-art facilities in the Northern Virginia region. Fairfax County is, along with Washington, a "core" employment jurisdiction of the Washington Metropolitan Area as indicated by this map. A U.S. Department of Labor study published in 2007 described Fairfax County as the second "economic pillar" of the Washington-area economy, along with the District of Columbia. The county has been described in Time as "one of the great economic success stories of our time." Fairfax County's economy revolves around professional services and technology. Many residents work for the government or for contractors of the federal government. The government is the largest employer, with Fort Belvoir in southern Fairfax being the county's single largest location of federal employment. Fairfax County has a gross county product of about $95 billion. 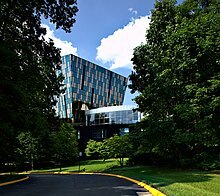 Fairfax County also is home to major employers such as Volkswagen Group of America, Hilton Worldwide, CSC (formerly Computer Sciences Corporation), Northrop Grumman, Science Applications International Corporation (SAIC), Leidos, Booz Allen Hamilton, Gannett, Capital One, General Dynamics, ICF International, Freddie Mac, Sallie Mae, ManTech International, Mars, NII and NVR. The county is home to seven Fortune 500 company headquarters, 11 Hispanic 500 companies, and five companies on the Black Enterprise 500 list. Northrop Grumman announced in 2010 that it would move its corporate headquarters from Los Angeles to Fairfax County. The county's economy is supported by the Fairfax County Economic Development Authority, which provides services and information to promote Fairfax County as a leading business and technology center. The FCEDA is the nation's largest non-state economic development authority. Fairfax County is also home to the Northern Virginia Technology Council, a trade association for local technology companies. It is the nation's largest technology council, with technology industry figures such as Bill Gates and Meg Whitman speaking at various local banquets. Fairfax County has a higher concentration of high-tech workers than the Silicon Valley. The Tysons Corner CDP of Fairfax County is Virginia's largest office market and the nation's largest suburban business district with 26,600,000 square feet (2,470,000 m2) of office space. It is the country's 12th-largest business district, and is expected to grow substantially in the coming decades. It contains a quarter of the county's total office space inventory, which was 105,200,000 square feet (9,770,000 m2) at year-end 2006, which is about the size of Lower Manhattan. 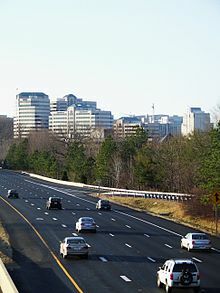 The area is noted by Forbes as "often described as the place where the Internet was invented, but today it looks increasingly like the center of the global military-industrial complex" due to being home to the nation's first ISPs (many of whom are now defunct), while attracting numerous defense contractors who have relocated from other states to or near Tysons Corner. Every weekday, Tysons Corner draws over 100,000 workers from around the region. It also draws 55,000 shoppers every weekday as it is home to neighboring super-regional malls Tysons Corner Center and Tysons Galleria. In comparison, Washington, D.C. draws 15 million visitors annually, or the equivalent of 62,500 per weekday. After years of stalling and controversy, the $5.2 billion expansion of the Washington Metro Silver Line in Virginia from Washington, D.C. to Dulles International Airport received funding approval from the Federal Transit Administration in December 2008. The Silver Line added four stations in Tysons Corner, including a station between Tysons Corner Center and Tysons Galleria. Along with the expansion of Washington Metro, Fairfax County government has a plan to "urbanize" the Tysons Corner area. The plan calls for a private-public partnership and a grid-like street system to make Tysons Corner a more urban environment, tripling available housing to allow more workers to live near their work. The goal is to have 95% of Tysons Corner within 1⁄2-mile (800 m) from a metro station. Fairfax County's average weekly wage during the first quarter of 2005 was $1,181, which is 52% more than the national average. By comparison, the average weekly wage was $1,286 for Arlington – the Washington metropolitan area's highest – $1,277 for Washington, D.C., and $775 for the United States as a whole. The types of jobs available in the area make it very attractive to highly educated workers. The relatively high wages may be partially due to the area's high cost of living. In early 2005, Fairfax County had 553,107 total jobs, up from 372,792 in 1990. In the area, this is second to Washington's 658,505 jobs in 2005 (down from 668,532 in 1990). As of the 2002 Economic Census, Fairfax County has the largest professional, scientific, and technical service sector in the Washington, D.C. area – in terms of the number of business establishments; total sales, shipments, and receipts; payrolls; and number of employees – exceeding the next largest, Washington, D.C., by roughly a quarter overall, and double that of neighboring Montgomery County. Annual festivals include the "Celebrate Fairfax!" festival held in June at the Fairfax County Government Center in Fairfax City, the Northern Virginia Fine Arts Festival held in May at the Reston Town Center in Reston, and the International Children's Festival held in September at the Wolf Trap National Park for the Performing Arts, which features a performing arts center outside the town of Vienna. Fairfax County supports a summer concert series held in multiple venues throughout the county on various nights. The concert series are called Arts in the Parks, Braddock Nights, Lee District Nights, Mt. Vernon Nights, Nottoway Nights, Spotlight by Starlight, Sounds of Summer and Starlight Cinema. Several major highways run through Fairfax County, including the Capital Beltway (Interstate 495), Interstate 66, Interstate 95, and Interstate 395. The American Legion Bridge connects Fairfax to Montgomery County, Maryland. The George Washington Memorial Parkway, Dulles Toll Road, and Fairfax County Parkway are also major arteries. Other notable roads include Braddock Road, Old Keene Mill Road, Little River Turnpike, State Routes 7, 28, and 123, and US Routes 1, 29, and 50. The county is in the Washington, D.C. metro area, the nation's third most congested area. Northern Virginia, including Fairfax County, is the third worst congested traffic area in the nation, in terms of percentage of congested roadways and time spent in traffic. Of the lane miles in the region, 44 percent are rated "F" or worst for congestion. Northern Virginia residents spend an average of 46 hours a year stuck in traffic. Washington Dulles International Airport lies partly within Fairfax County and provides most air service to the county. Fairfax is also served by two other airports in the Washington area, Ronald Reagan Washington National Airport and Baltimore-Washington International Thurgood Marshall Airport. Manassas Regional Airport, in neighboring Prince William County, is also used for regional cargo and private jet service. Fairfax County has multiple public transportation services, including the Washington Metro's Orange, Blue, Yellow, and Silver lines. The Silver line, which runs through the Tysons Corner and Reston areas of the county, opened in 2014 as the first new Washington Metro line since the Green Line opened in 1991. In addition, the VRE (Virginia Railway Express) provides commuter rail service to Union Station in Washington, D.C. with stations in Fairfax County. The VRE's Fairfax County stations are Lorton and Franconia/Springfield on the Fredericksburg line, and Burke Centre, Rolling Road, and Backlick Road on the Manassas line. Fairfax County contracts its bus service called the Fairfax Connector to Transdev. The county also is served by WMATA's Metrobus service. The county has many protected areas, a total of over 390 county parks on more than 23,000 acres (93 km2). The Fairfax County Park Authority maintains parks and recreation centers through the county. There are also two national protected areas that are inside the county at least in part, including the Elizabeth Hartwell Mason Neck National Wildlife Refuge, the George Washington Memorial Parkway, and Wolf Trap National Park for the Performing Arts. The Mason Neck State Park is also in Lorton. Fairfax County is member of the Northern Virginia Regional Park Authority. The Reston Zoo is in Reston, Virginia. The National Zoo is located nearby in Washington, D.C. The county maintains many miles of bike trails running through parks, adjacent to roads and through towns such as Vienna and Herndon. The Washington & Old Dominion Railroad Trail runs through Fairfax County, offering one of the region's best, and safest, routes for recreational walking and biking. In addition, nine miles (14 km) of the Mount Vernon Trail runs through Fairfax County along the Potomac River. However, compared to other regions of the Washington area, Fairfax County has a dearth of designated bike lanes for cyclists wishing to commute in the region. On May 16, 2008, Bike-to-Work Day, the Fairfax County Department of Transportation released the first countywide bicycle route map. The Fairfax Cross County Trail runs from Great Falls National Park in the county's northern end to Occoquan Regional Park in the southern end. Consisting of mostly dirt paths and short asphalt sections, the trail is used mostly by recreational mountain bikers, hikers, and horse riders. Map of Fairfax County showing incorporated cities and CDPs. Three incorporated towns, Clifton, Herndon, and Vienna, are located entirely within Fairfax County. The independent cities of Falls Church and Fairfax were formed out of areas formerly under the jurisdiction of Fairfax County, but are politically separate, despite the status of the City of Fairfax as county seat. It has been proposed to convert the entire county into a single independent city, primarily to gain more control over taxes and roads. The most recent such proposal was made June 30, 2009. Other communities within Fairfax County are unincorporated areas. Virginia law dictates that no unincorporated area of a county may be incorporated as a separate town or city following the adoption of the urban county executive form of government. Fairfax County adopted the urban county executive form of government in 1966. Many of these areas have addresses in Alexandria, Falls Church, and Fairfax City. George Mason – Of Gunston Hall, "Father of the Bill of Rights"
Nguyễn Cao Kỳ – South Vietnamese Prime Minister, Vice President, and Air-Force General. Initially lived in Fairfax County in the late 1970s after the fall of Saigon. James Gattuso - Senior Research Fellow for the Heritage Foundation and former Associate Director for Vice President Dan Quayle. Jimmy Workman – Actor in The Addams Family (1991) and Addams Family Values (1993). Christina Hendricks – Actress in Mad Men and Firefly, attended Fairfax High School. Prince Poppycock – Season Five fourth place finalist of America's Got Talent from Great Falls. Nguyễn Cao Kỳ Duyên – Grew up in Fairfax County after the fall of Saigon. Co-host of Thuy Nga's Paris By Night. Amy Ziff – Musician in BETTY. Elizabeth Ziff – Musician in BETTY. Robert Hanssen – American spy who sold secrets to the USSR and Russia. Christopher McCandless – American wanderer who went to Alaska to try to "find himself" and died in the process. The novel Into the Wild is based on his journey. Steve Scully – Host, political editor, and senior producer of C-SPAN's Washington Journal, resides in Fairfax Station with his family. ^ "State & County QuickFacts". United States Census Bureau. Archived from the original on July 10, 2011. Retrieved January 2, 2014. ^ Morello, Carol; Keating, Dan (December 2010). "D.C. region is nation's richest, most educated". Washington Post. Retrieved December 18, 2010. ^ a b Bishaw, Alemayehu; Semega, Jessica (August 2008). "Income, Earnings, and Poverty Data From the 2007 American Community Survey" (PDF). American Community Survey Reports. p. 7. Retrieved April 25, 2010. ^ Brett Krasnove (May 9, 2014). "Fortune 500 - Fortune". Fortune. Retrieved March 16, 2016. ^ "The Historical Society of Fairfax County Virginia". Fairfax County Historical Society. Retrieved January 25, 2010. ^ "City History". City of Fairfax. Archived from the original on May 5, 2006. Retrieved April 25, 2010. ^ Matt Woolsey (January 22, 2008). "America's Richest Counties". Forbes. Retrieved January 25, 2010. ^ "Naturally Occurring Asbestos in Fairfax County, Virginia". Fairfax County. Retrieved September 5, 2016. ^ Janet Raloff (July 8, 2006). "Dirty Little Secret". Science News Online. Archived from the original on January 16, 2008. Retrieved April 26, 2010. ^ C. James Dusek and John M. Yetman. "CONTROL AND PREVENTION OF ASBESTOS EXPOSURE FROM CONSTRUCTION IN NATURALLY OCCURRING ASBESTOS" (PDF). Archived from the original (PDF) on September 27, 2006. Retrieved July 12, 2013. ^ "Overcoming Problems with Marine Clays". Fairfax County. Archived from the original on April 7, 2010. Retrieved April 25, 2010. ^ "Fairfax city, Virginia Archived December 18, 2005, at the Wayback Machine." U.S. Census Bureau. Retrieved on April 4, 2009. ^ "Fairfax County General District Court Archived March 31, 2009, at the Wayback Machine." Fairfax County. Retrieved on April 4, 2009. ^ "Democrats claim GOP Fairfax seat in Virginia Senate". The Washington Post. ^ Kravitz, Denny (January 13, 2010). "Democrat wins Va. Senate race". The Washington Post. Retrieved April 25, 2010. ^ "2015 January Specials 34th & 63rd HOD: 01/06/2015 - Virginia Department of Elections". Retrieved March 16, 2016. ^ "Loudon County Newsletter" (PDF). Loudon County Department of Economic Development. February 2002. p. 3. Archived from the original (PDF) on May 27, 2010. Retrieved April 26, 2010. ^ "Mansions for Sale in Virginia". The Luxury Brokers. Retrieved April 26, 2010. ^ Fairfax County QuickFacts from the US Census Bureau Archived July 10, 2011, at WebCite. Quickfacts.census.gov. Retrieved on August 16, 2013. ^ "WTOP: Washington, DC's Top News, Traffic, and Weather". WTOP. November 18, 2014. Retrieved March 16, 2016. ^ "Fairfax County Budget – FY 2007" (PDF). Fairfax County. February 27, 2006. Retrieved August 2, 2008. ^ "Office of Budget Services". Fairfax County Public Schools. Archived from the original on May 10, 2010. Retrieved April 25, 2010. ^ "Fairfax County Public Schools - Moved". Archived from the original on March 3, 2016. Retrieved March 16, 2016. ^ "VCU School of Medicine – Inova Campus". Virginia Commonwealth University. Retrieved April 30, 2009. ^ Reuters Editorial (November 30, 2007). "Fairfax County high school ranked the best in the nation; two other county schools..." Reuters. Retrieved March 16, 2016. ^ Frederick, Missy (February 4, 2009). "Hilton Hotels picks Fairfax County for new HQ Read more: Hilton Hotels picks Fairfax County for new HQ – Los Angeles Business from bizjournals". Washington Business Journal. Retrieved April 25, 2010. ^ "Fortune 500: Our Annual Ranking of America's Largest Corporations". CNN Money. Retrieved April 25, 2010. ^ Echols, Tucker (July 21, 2009). "Hispanic businesses boosting Fairfax County". Washington Business Journal. Retrieved April 25, 2010. ^ "Microsoft's Bill Gates Selects March 13 NVTC Titans Breakfast as Forum for Providing..." Reuters (via PR Newswire). March 11, 2008. Retrieved April 25, 2010. ^ "Meg Whitman, Former CEO and President of eBay Addresses Crowd of Approximately 800 at NVTC's TechCelebration Annual Banquet". Northern Virginia Technology Council. October 27, 2008. Retrieved May 3, 2009. ^ Tidwell, Mike (November 2, 2008). "High-Tech, High-Income, High-Polluting Virginia". The Washington Post. Retrieved April 25, 2010. ^ "Tysons Corner, Virginia". BeyondDC. Archived from the original on March 3, 2007. Retrieved January 20, 2007. ^ "Tysons Corner Business Area". Fairfax County Economic Development Authority. Retrieved April 20, 2010. ^ "The CoStar Office Market Watch". The Washington Post. Retrieved November 12, 2009. ^ "Why Virginia's Become Mecca For Military Contractors". Forbes. October 10, 2011. Retrieved March 16, 2016. ^ "Silver Line To Dulles Wins Crucial Federal Okay". Retrieved March 16, 2016. ^ Lisa Selin Davis (June 11, 2009). "A (Radical) Way to Fix Suburban Sprawl". Time Magazine. ^ a b c d Perrins, Gerald; Nilsen, Diane (December 2006). "Industry Dynamics in the Washington, D.C. area: has a second job core emerged?" (PDF). Monthly Labor Review. Retrieved April 25, 2010. ^ "American Community Survey 2012 Profiles for Fairfax County, Virginia" (PDF). U.S. Census Bureau. September 2012. Retrieved August 9, 2017. ^ "County of Fairfax, Virginia Comprehensive Annual Financial Report, for the Year ended June 30, 2016" (PDF). fairfaxcounty.gov. ^ GRACE,Festival. Restonarts.org (July 31, 2008). Retrieved on 2013-08-16. ^ "2009 Summer Entertainment Series". Fairfax County. Retrieved April 2, 2010. ^ "Clifton Film Fest". Arts Fairfax. ^ "Measuring Virginia's Traffic Congestion, Infrastructure and Land Use – Virginia Performs". Council on Virginia's Future. Archived from the original on February 11, 2008. Retrieved September 3, 2007. ^ Schrank, David; Lomax, Tim (June 2002). "The 2002 Urban Mobility Report". Texas Transportation Institute. ^ "Silver Line opening will be a boon for Northern Virginia". Washington Times. ^ "Station Map". Virginia Railway Express. Retrieved April 2, 2010. ^ "Fairfax Count Park Authority". Fairfax County. Archived from the original on February 25, 2009. Retrieved March 3, 2009. ^ "About the Zoo". Reston Zoo. Retrieved September 26, 2010. ^ "Fairfax County Bicycle Route Map". Fairfax County. Archived from the original on May 4, 2010. Retrieved April 23, 2010. ^ "Subcounty population estimates: Montana through Wyoming 2000–2007" (CSV). United States Census Bureau, Population Division. Retrieved May 9, 2009. ^ "§ 15.2-817. No unincorporated area to be incorporated after adoption of urban county form of government". Retrieved March 16, 2016. 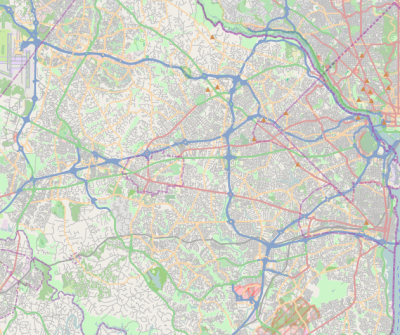 ^ "Census-Designated Places in Fairfax County, Virginia". Geographic Names Information System. United States Geological Survey. Retrieved January 28, 2012. ^ "George Mason". Gunston Hall. Retrieved April 21, 2009. ^ "A Brief Biography of George Washington". Mount Vernon Plantation. Archived from the original on August 23, 2011. Retrieved April 25, 2010. ^ "Birthplace of Fitzhugh Lee". Marker History. Retrieved August 2, 2011. ^ "Astronaut Bio: Catherine Coleman". NASA. November 2009. Retrieved April 25, 2010. ^ "Ed Moses". USA Swimming. Archived from the original on May 13, 2007. Retrieved December 2, 2007. ^ "Biography Jun-Jae-Young". KBS World. Retrieved April 23, 2010. ^ "Lauren Graham Biography". Yahoo! Movies. Retrieved February 3, 2009. ^ "Amy Ziff Biography". IMDb Movies. Retrieved May 24, 2015. ^ "Elizabeth Ziff Biography". IMDb Movies. Retrieved May 24, 2015. ^ a b c "Sisterhood Partnerships". Retrieved March 16, 2016. ^ Tierney Plumb (June 23, 2010). "Fairfax County teams up with Chinese city". Washington Business Journal. Retrieved March 16, 2016. Wikimedia Commons has media related to Fairfax County, Virginia. Wikivoyage has a travel guide for Fairfax County. Festival information for Celebrate Fairfax!